The original Harris Tweed loom was the beart bheag (small loom in Gaelic), a small wooden loom predominantly used prior to 1900. Made locally, it was traditionally used by women for domestic purposes. The heald shafts (na buird) were activated by four treadles connected with cords to the healds. The shuttles, which were boat-shaped, carried a metal pin, round which revolved the sheep’s shin bone onto which the weft yarn had been wound. The loom had no shuttle boxes and the shuttle was thrown by hand from side to side through the open shed. This was succeeded by the beart mhòr (big loom in Gaelic) handloom, used to produce tweeds from around the turn of the 20th Century. It was of much larger construction but the healds worked on the same principle as in the bheart bheag. It had, however, a sleyboard with a box at either end and the shuttle was thrown by pickers, to which movement was imparted by cords controlled by the weaver. The shuttle was bigger and had wheels on the underside and back, and it was propelled across the warp by a sharp pull on a handle. This was known as the ‘flying shuttle’. The loom had a greater output per hour than its predecessor but was much heavier and so was often more used by men. The Big Loom first appeared on the islands in 1890s and by 1911 there were over 250 in operation. The basic Mark I loom was treadle operated and the amount of effort to start the machine from rest, and to keep it in motion,varied from loom to loom, dependent on how well it has been erected and tuned. Basically, no two looms feel the same to weave on – they all have distinct personalities – and this is where their charm comes from. 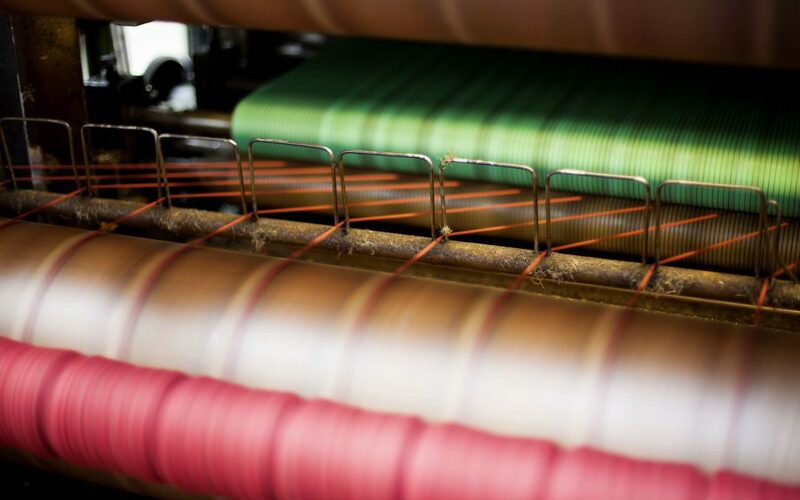 Today the vast majority of our Harris Tweed is woven on The Bonas Griffiths. Trialled in the early 1990’s and shortly after introduced as the new industry standard, the Bonas Griffiths loom was of double width to meet commercial demand for a wider, lighter cloth. It was twice the size, cleaner, quieter and took less effort to work. The old shuttle was replaced by a flexible rapier system (eliminating the need for pirn winding). The loom is now the work-horse of the Harris Tweed industry being used by the majority of the 140 weavers currently working in the Outer Hebrides.